46 year-old female presented with a two-week history of an abscess over the left parotid area. 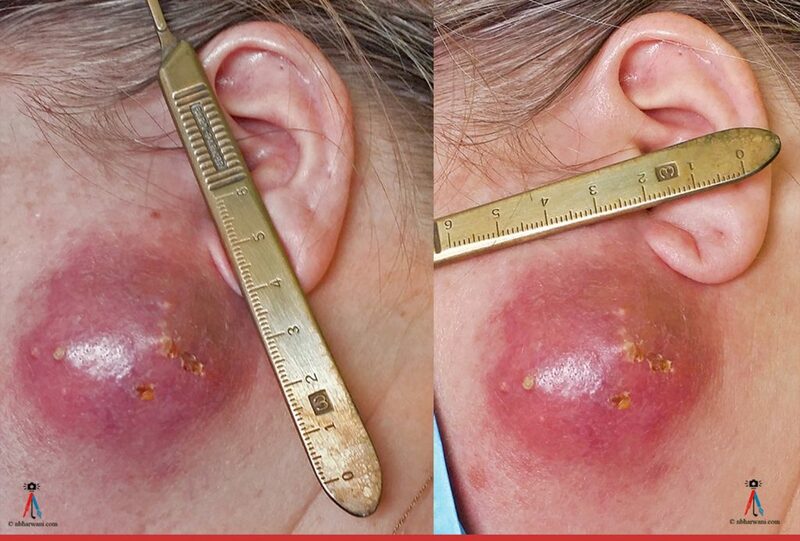 The patient reports an abscess in the same location 18 months prior which she had aspirated. She has a medical history of Sjögren’s syndrome. The patient had finished a course of amoxicillin-clavulanic acid and then was started on a course of a cephalosporin. Incision and drainage was done under local anesthetic and a large amount of pus was drained. The patient healed well. Pathology: Showed no parotid tissue. 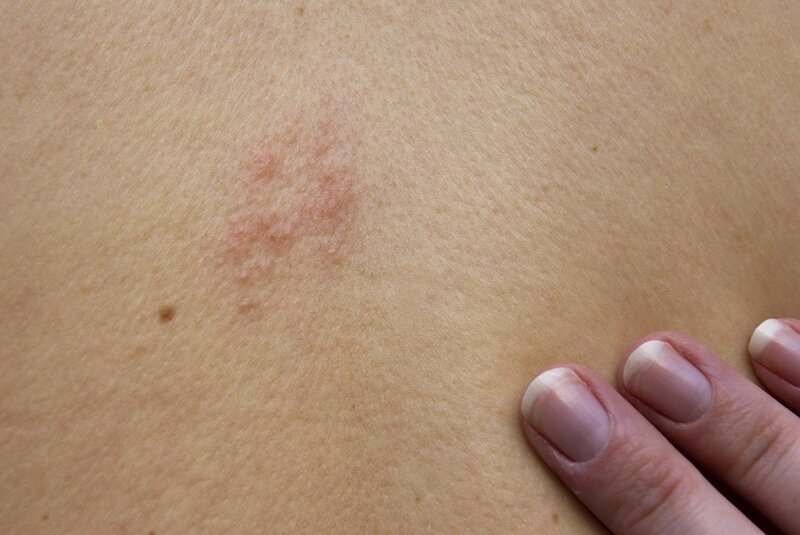 There was acute-on-chronic inflammation of subcutaneous tissues. Symptoms – One-sided salivary gland swelling. Fever and pain will accompany the swelling. Pathogens – Typically normal bacteria found in the mouth. Viral infections such as mumps often affect the salivary glands. Mumps most often involves parotid salivary gland. Mumps is a rare problem today because of the MMR vaccine. Dehydration and malnutrition raise the risk of getting a bacterial infection. This is a chronic autoimmune disease in which cells of a person’s immune system attack the salivary and other moisture-producing glands, leading to dry mouth and eyes. About half of people with Sjögren’s syndrome also have enlargement of the salivary glands on both sides of the mouth, which is usually painless. Antibiotics for fever or pus drainage, or if the infection is caused by bacteria. Antibiotics are not useful against viral infections. Surgery or aspiration to drain abscess. Practice good oral hygiene. Brush teeth and floss well at least twice a day. This may help with healing and prevent infection from spreading. Rinse mouth with warm salt-water rinses (1/2 teaspoon of salt in 1 cup of water) to ease pain keep the mouth moist. Most salivary gland infections go away on or are cured with treatment. Some infections will return. Complications are uncommon. In many cases, salivary gland infections cannot be prevented. Good oral hygiene may prevent some cases of bacterial infection. A 47 year-old male presented with a three-month history of a lump below the right eyelid. It was slowly getting bigger. The lump was excised under local anaesthetic. The specimen consists of a tan and brown irregularly shaped piece of skin measuring 1.3 x 0.5 x 0.2 cm. Attached is an underlying cyst-like structure measuring 1.0 x 0.5 x 0.5 cm. The cyst-like structure is extremely friable. The margins are marked with blue ink. Pilomatricoma is a benign cystic new growth. Clinically, pilomatricoma usually presents in young individuals as a solitary cutaneous nodule with an average size of one cm and rarely exceeds 2 cm in diameter. 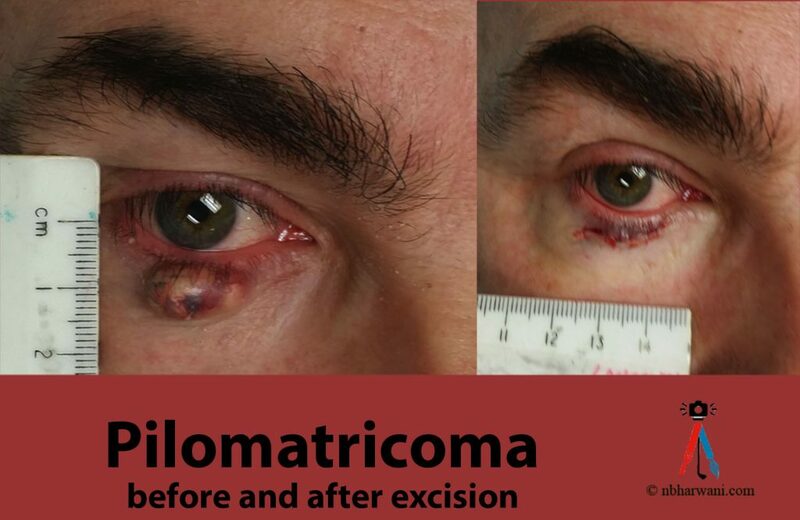 Proliferating pilomatricoma was first described in 1997. The lesions are usually situated mostly on the head and neck. The differential diagnosis includes classical pilomatricoma, pilomatrical carcinoma, and basal cell carcinoma. These neoplasms should be excised with adequate surgical margins, and careful follow-up examinations are strongly recommended. Proliferating pilomatricoma can occur at younger ages and should be considered in the differential diagnosis of solitary lesions in adults and children, even if the lesion is rapidly growing. A woman with locally advanced breast cancer. The traditional way to assess a breast lump is to take a history, do a physical examination, do a fine needle aspiration cytology (examination of a breast lump aspirate under a microscope), mammogram and/or ultrasound, core biopsy under ultrasound control and finally, if there is no satisfactory answer then do a surgical biopsy. A surgical biopsy gives us a definitive answer. But there are drawbacks to sending every patient with a breast lump for surgery. To start with it causes severe anxiety. You have to take a day off work. It requires local or general anaesthetic. There may or may not be postoperative complications like bleeding, bruising, discomfort, infection and pain. On a long term basis, surgical biopsy will leave you with a scar and may be another lump which may be just a scar tissue but could be suspicious for cancer. Then you have to go through the whole process all over again. Is there anything else we can do before going for surgery to make sure that there is no cancer in the breast? You can ask for a second opinion. If all investigations are negative then there is a less than five per cent chance that cancer has been missed. In that case, we can leave the lump alone and provide follow up care with clinical examination and mammography or ultrasound, on a case by case basis. Sometimes a patient will ask for MRI. MRI (magnetic resonance imaging) is a procedure that uses a magnet, radio waves, and a computer to make a series of detailed pictures of areas inside the body. MRI does not use any x-rays. MRI is not available for routine screening. It is expensive and requires specialized equipment and personnel with good solid training to read the images. Hence, it is available in bigger cities only and is not covered by government insurance plans. MRI is more often used for breast imaging in the US than Canada because of the prevalence of private health care. MRI is sensitive to small abnormalities in breast tissue. MRI also has limitations. For example, MRI cannot detect the presence of calcium deposits, which can be identified by mammography and may be a sign of cancer. The value of breast MRI for breast cancer detection remains uncertain. And even at its best, MRI produces many uncertain findings. Some radiologists call these “unidentified bright objects,” or UBOs. 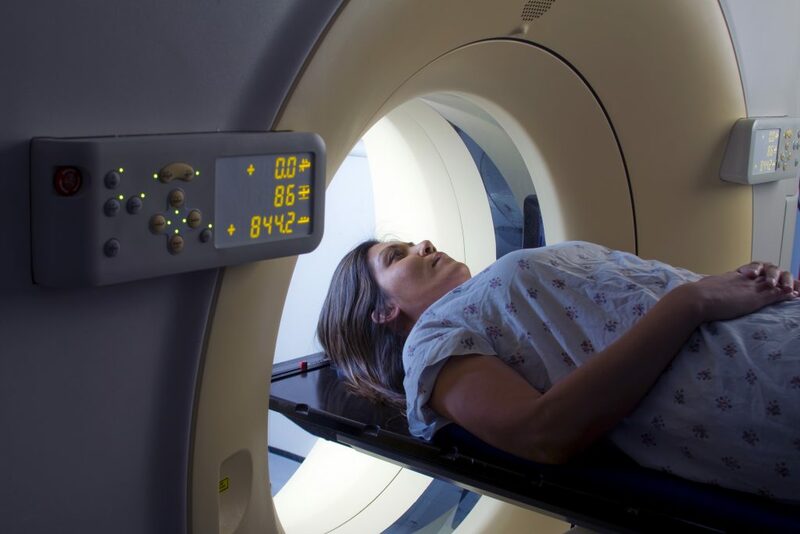 In women with a high inherited risk of breast cancer, screening trials of MRI breast scans have shown that MRI is more sensitive than mammography for finding breast tumors. Screening studies are ongoing. Breast MRI is not recommended as a routine screening tool for breast cancer. However, for women at high risk, women with previous breast cancer, MRI can be useful in certain circumstances.